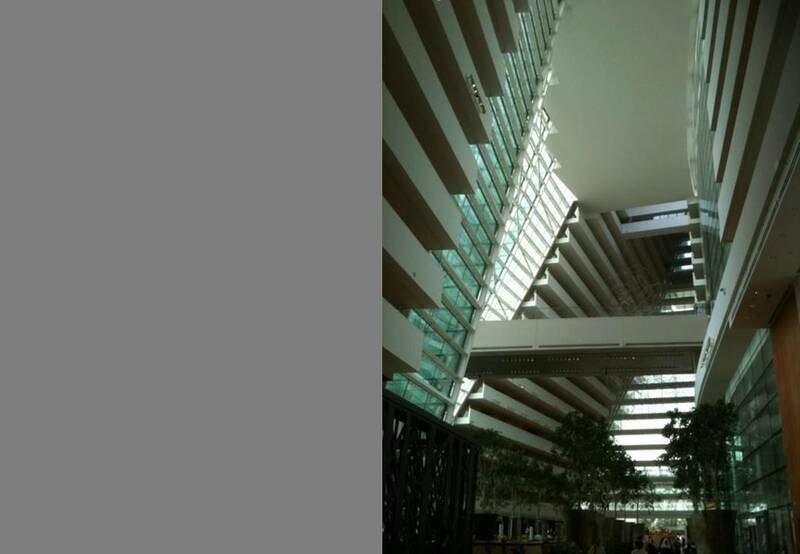 Marina Bay Sands (MBS) needs little introduction. 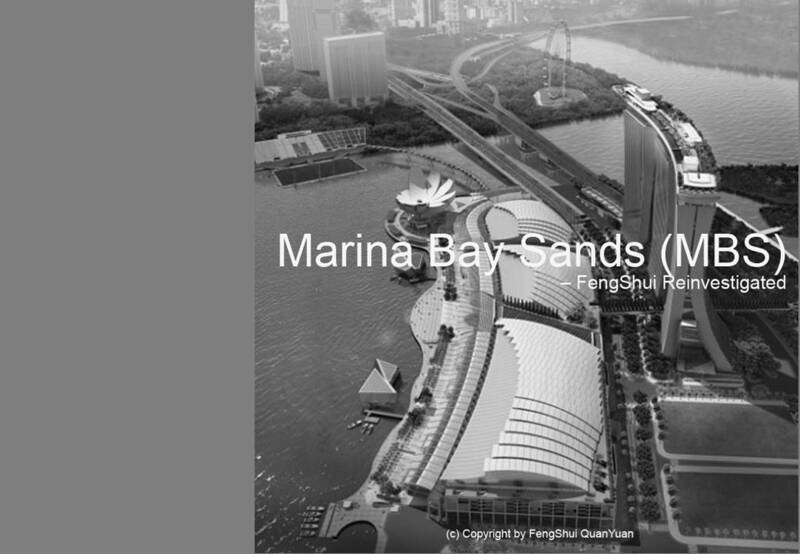 This paper is an attempt to investigate MBS FengShui and its role in crafting the entire FengShui landscape for Singapore. The general landform of Singapore, receiving the incoming from the Northeastern Titiwangsa Range, embraced by Sumatra and Kalimantan with its table mountain at Batam and its own Parent Mountain Bukit Timah fulfills the ideal arm chair formation of a meridian which is a very good reason for its prosperity at unprecedented rate. 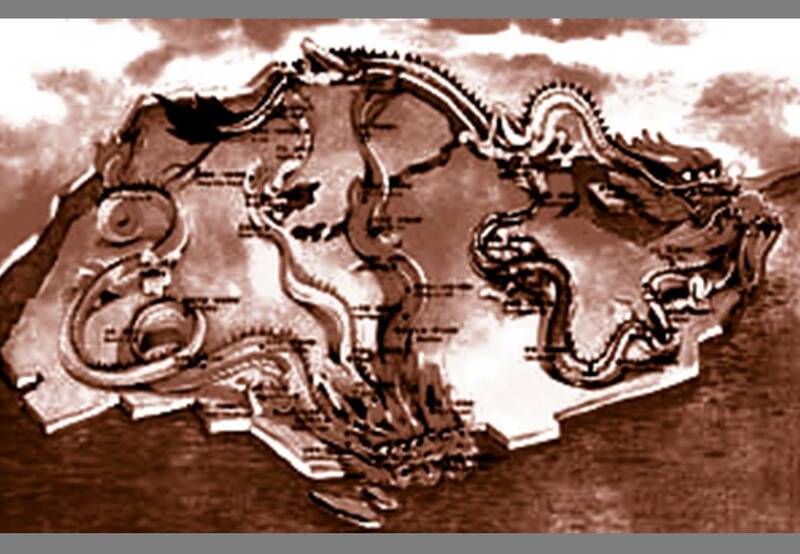 It then spread into another 5 different veins, coined the 5 dragons of Singapore of much tale to be found elsewhere. 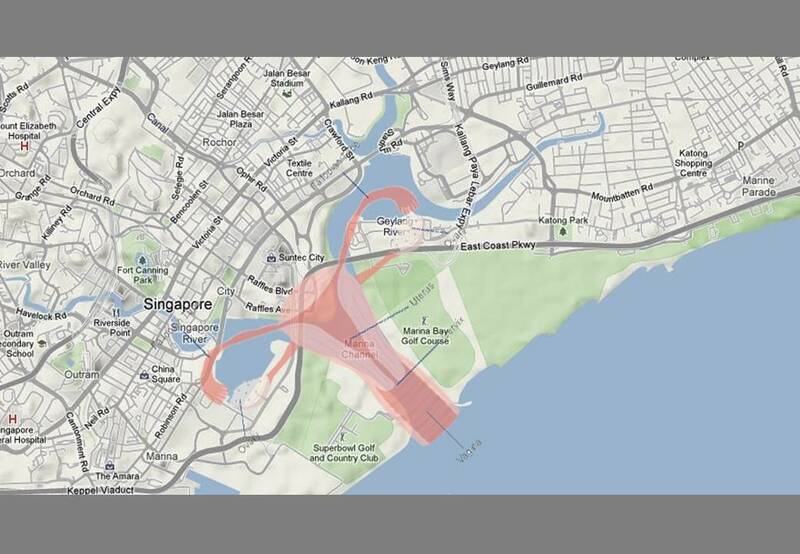 A more notable expansion is it’s ever hunger for more land, resulting in reclamations and the shifting of the Singapore river mouth. The original mouth was said to have brought Singapore out of Malaya into its own destiny, owing to the formation of “Carp jumping over the Lion’s Gate”. 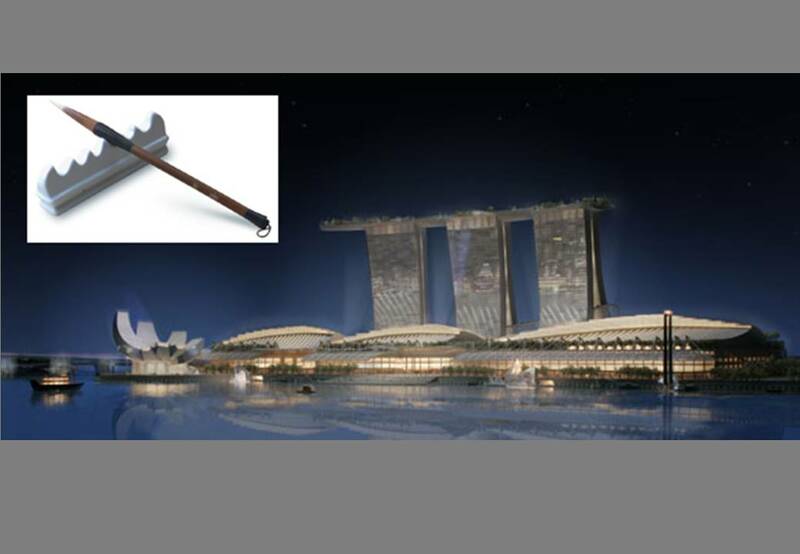 In terms of landform it is just the locking of the mouth by virtue of the Fullerton Building and the symbolic statute of Merlion. By such doing, Qi would not be easily dispersed. However, Singapore had its own set of problems too. 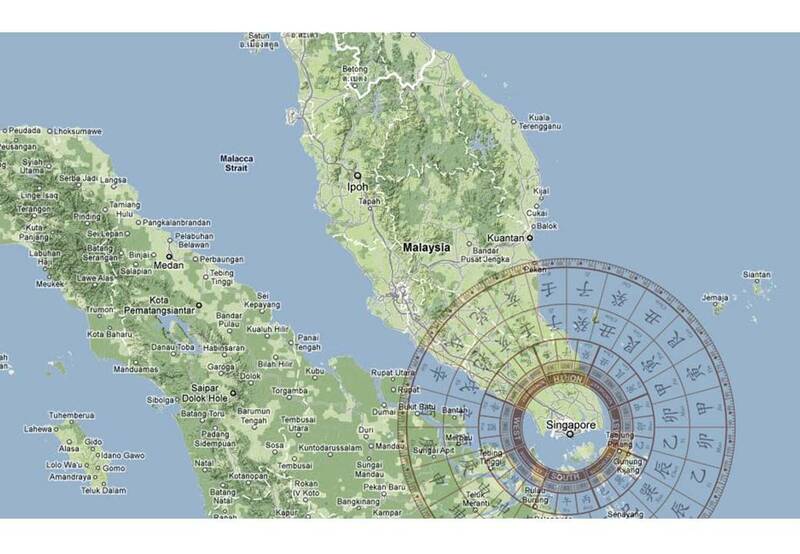 The new FengShui formation based on the new water mouth in Marina Bay; it is hope that Singapore would prosper for perpetuity. With the aging population, the desire to increase its population remains the main factor besides economic strength. One reason as to why the bay was crafted in the form of a womb somewhere closer to the SE sector (Xun) as it remains timely as the sub-direct spirit for period 9, hopes for more young women of Singapore to bear children. Controversies soared as usual with anything FengShui. The Three “Ancestral Tablet” looking buildings of Sands remain the epitome of water Mouth Mountain, as it may resemble the Chinese character of Mountain as in Shan (山) or a brush recliner formation or SanJi or the three nobles of FuLu and Shou. 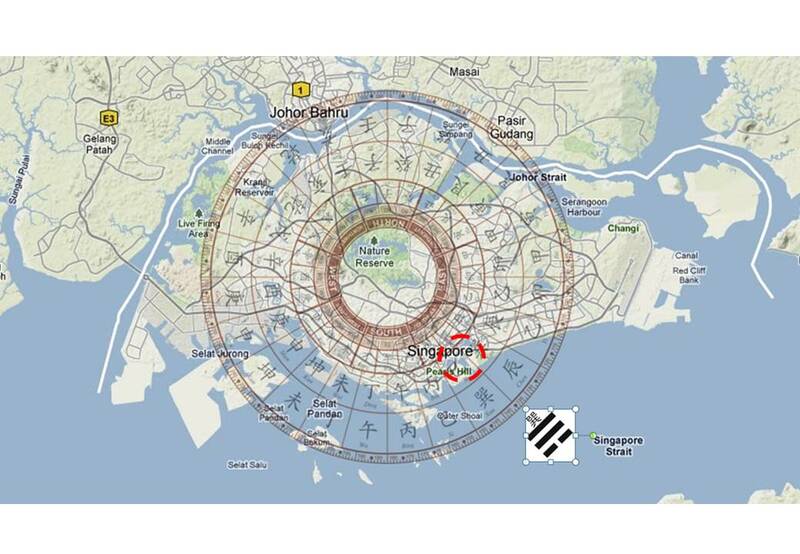 Others may criticize on the arched sky deck as a form of sickle killing Qi that will curse Singapore forever. Yet, it remains a wonderful piece of Architectural icon, cleverly crafted with FengShui formation in mind. A closer inspection of MBS Chen sitting, Xu facing building conforms to Xin meeting Ren, Yang water structure. Water exits at the rear of the said building leaving the front receiving Bath and Youth water, MBS will strive to provide the best entertainment in town beside gambling and theme parks. The quality of the Bright Hall with the table mountain of Fort Canning contributes to the welfare of MBS and for such there is a good reason for the government to impose levy upon its own citizen who wish to gamble there. The quality of water remains an important factor. 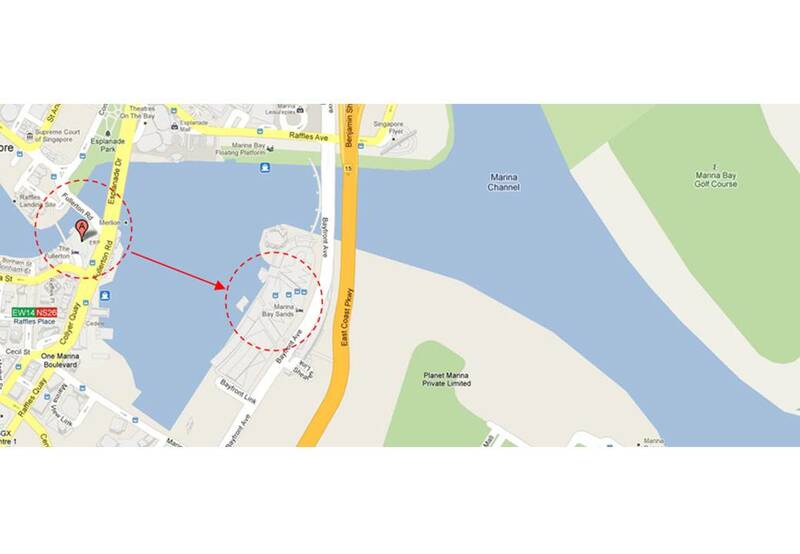 The East Coast Parkway (ECP) does channel Qi from the Marina Promenade side which appears to be at higher ground. Virtual rivers incoming from Youth exiting Grave conforms to Golden Goat receiving JiaGui Qi Yang wood structure. It is where the so called Ancestral Tablet looking building located giving the virtual supporting mountain to MBS. The small protruding White Tiger Embrace locating the “Lotus” liked Art Science Museum is a typical hall mark approach of XinFa’s extending Sha methodology and unlikely reason to compensate for the lack of the White Tiger embrace, all conforming to the balance of Pure Yin and Pure Yang principle. Speaking of such, the notorious Singapore Flyer, located at Chou, accused to have been turning at the wrong side, was acting as the catalyst in spurring Qi flows. No doubt, the Heaven’s Heart is unenclosed; such Qi stimulation does contributed to the YinYang balance of the entire set up. These explain as to why there were so many teething problems arising to Singapore while MBS was in the midst of construction. On matter of Flying Star analysis, one source revealed that MBS was sitting east facing west. Taking the idea of Yang facing of the entire building, technically speaking, and the building should have face Xu Northwest sitting Chen Southeast. So, it is rather force fitting to demonstrate that double 8 indeed has arrived at the facing of the said building, so much so that a 7 star robbery formation of the facing star does exist lasting the entire SanYuan BuBai of 180 years, encapsulating the entrance #8 with the Helix Bridge #5 and the Garden Bay bridge #2. On another account, such west facing would have violated the direct indirect spirit principle which is a major taboo for SanYuan methodology. So, how would a 7 star robbery formation of the facing star works, given the violation of the first principle? 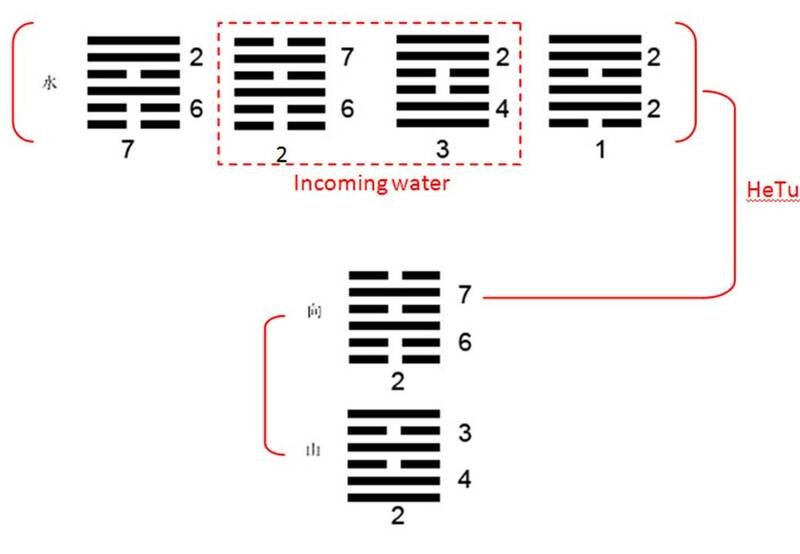 The real application of SanYuan rests within its ability to connect Qi, where water features are the typical hallmark coupled with YinYang modulation via space and volume. The above DaGua formation demonstrated Qi connections between the water ways and the facing respectively between the thresholds of 2 Gua. There appear to be a choice to choose between real water and virtual water, which the selection would have been natural. The facing Gua is 4th generation from the palace of Dui which made Xun, Qian and Li out of Gua similarly with west river Gua family. Yet, all these are applied externally. The interior of the mall display something identical, using water to distribute Qi. 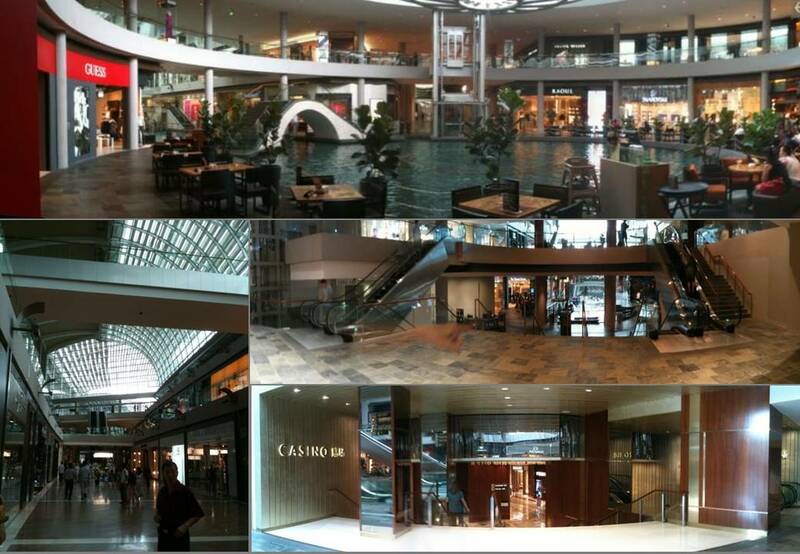 Here we observed how water jeopardizes Qi flow within the context of the mall. Easily observed that people gathered at the atrium for food while the rest of the corridor fronting the water ways are lack of crowds while those corridor without water ways are packed with shoppers. Any liked minded practitioners would have concluded that these water ways are “cutting feet”, obstructing Qi flow rather than connecting Qi. One very novel idea as observed is how to design incoming water as compare to outgoing water. Entrance to the casino is a class of its own. Observe how the use of volume and space create the real Qi connections between one space to another and one entrance to another. It does not need to conform to any formula based FengShui. Just pure landform would do. Similarly with the hotel component which is within the 3 “Ancestral Tablet” looking building. The sheer modulation of its ceiling height speaks volume but yet not all eateries located around the lobby benefitted from it. This time around the novel idea of incoming Qi mouth and outgoing Qi mouth does not depend on water but in its size. Size, finally does matter. 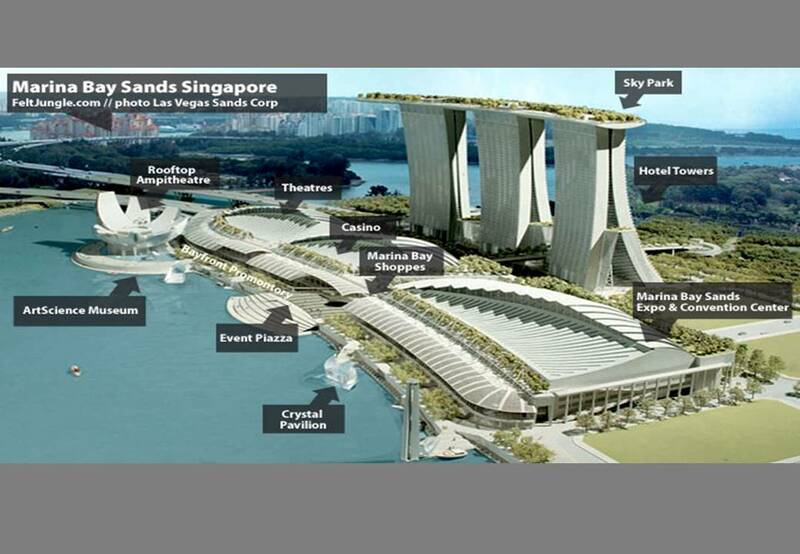 In summary, the entire urban planning of MBS together with the marina has been engineered to maximize Qi containment within the context of the island state. Flying Star does not work in this scale while real landform became the primary tool. The carving of the marina, the location of MBS with its monolithic forms, the Singapore Flyer, the Arts and Science center, the connection highways are all carefully positioned in response to natural landforms and hills within the vicinity. The interior layout has been crafted, as believed, not by a single practitioner as there are too many conflicting methodologies applied while some works, others don’t. One thing for sure, water methods applied wrongly will bring about negative results. Saying thus, there is also the possibility of other forms of FengShui installed. Noted that the official practitioner the late Chong Swan Lake, credited to have engineered the FengShui formation passed away before it was even completed. Shortly thereafter 2 key officers of MBS quit or asked to leave. Chong’s student mentioned that she took over. The sudden death of Chong may have been planned as fulfilling a “need” for human sacrification. At the end, say what as it may, the real substance is still landforms – End of story.